Happy Friday night everyone! I've been away from blogging for a bit, life's keeping me busy. I have a new drink review for you though, so that should smooth things over until the next comics post. 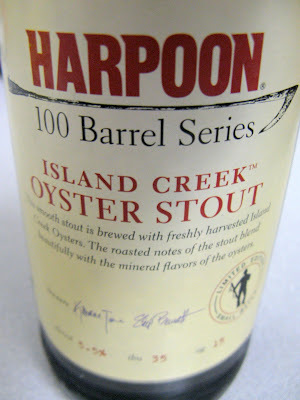 Today I have for you a review of Harpoon Brewery's 100 Barrel line of beers' newest release, Island Creek Oyster Stout. The 100 Barrel Series is a limited release beer, Harpoon releases new brews every few months. The last release was a Ginger Wheat which was very good, if you look you can probably still find some available. The thing about 100 Barrels is that they only make 100 barrels, so once it's gone it's gone. They have gone back and made some popular releases occasionally, but not often. I believe I have tasted all of the 30 releases, some have been better than others but they are always worth trying. Ok, on to the beer in question. Yes, the beer is made with real oysters, I remember seeing Harpoon's Facebook updates about harvesting the oysters themselves. I actually don't think I've seen them so excited about a beer before! So, upon first whif and taste I didn't get much of anything, it smelled like a stout but nothing out of the ordinary. It was a mild first sip and I didn't immediately get any oyster flavors, but on my second taste it finally caught up to me. The aroma was a bit briney and there is a definite sweet brine finish, which is an odd sensation for a stout! The more I drink it the more defined it seems to get. It's salty more than oystery but not unpleasantly salty. I have to say, I wish I had some oysters or even clams to wash down with this beer. It's not a party beer, but it would go very nicely with a few bivalves! Letting the taste sit on my tongue I can finally really get the oyster, I think that I might not enjoy it if I was just handed this drink with no knowledge of what it is. I would put it firmly in the "acquired taste" category, but since I sought the Oyster Stout out, I can't say I'm disappointed. To sum it all up, Harpoon Island Creek Oyster Stout is not for the weak of heart but if you are looking for something different, you can't get much more of it!